As graduation approaches, freshmen excitedly look forward to the completion of their first year of college. Meanwhile, seniors look to the future with a combination of anticipation and trepidation. Regardless of your class year, students of all ages try to make the most of these last couple weeks at F&M. Now in my senior year, here are some of my favorite Lancaster activities I’ll be trying to do one last time before I graduate in May. One of my favorite destinations for a nice day, grab a friend and go see some adorable baby cows and get some ice cream. 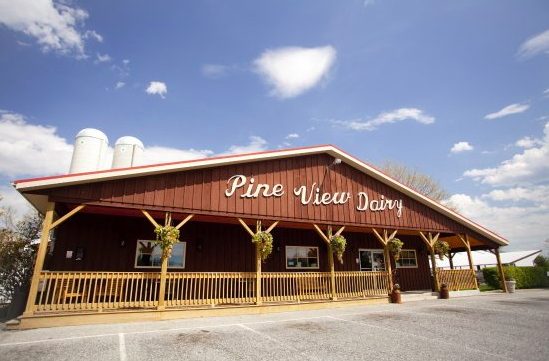 Pine View Dairy boasts a number of unique ice cream flavors (Espresso Oreo Caramel, Maple Walnut, and Strawberry Cheesecake just to name a few) and there are calves housed in nearby stalls for visitors to interact with. Careful though, they will try to steal a lick of your ice cream. You’d be amazed how many people don’t know about the Buchanan Park Carnival despite its proximity to campus. This year the event runs from May 1-4, and it’s not one you’re going to want to miss. Students have been known to walk away with pet goldfish, and the games and rides are a lot of fun. The classic carnival food is also a good move if you’re looking for some off campus food. For more information about the event, visit: https://www.pa-carnivals.com/2019/buchanan-park-carnival-2019-lancaster-pa/. Always a classic, Lyndon is the perfect spot for students looking for some late night food. My favorites from the menu include the Lyndon Nachos, Alpine Omelette, Black and White Milkshake, and a classic Mushroom and Swiss Burger with a side of fries. It’s F&M tradition to go to Lydon after an event to celebrate, so a post finals visit may be in my future. As the year winds down, there’s often a mad dash of last minute assignments and projects leading up to exams. Though it can feel like there’s no time to spare, try to relax and savor these last couple of weeks on campus with friends. You’re not going to look back on your year fondly remembering the time you spent cramming in the library, but you will look back on your time spent with friends with a smile. Senior Abigail Sokolsky is the Editor Arts & Leisure. Her email is asokolsk@fandm.edu.